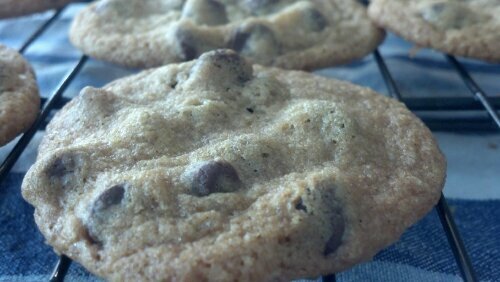 I just made some spur of the moment chocolate chip cookies with some staples that I had around the house. It became apparent to me that I only had dark brown sugar instead of the light brown sugar which I have usually used. I think I understand that my preference has to do with the caramelization that can be seen on the edges of chocolate chip cookies baked using light brown sugar. I know cookies are done and taste good, and the texture is just right, I’m just giving myself poor marks for presentation. …but yeah….they are still tasty! Nom-nom-nom! ← Boiled Egg Game Changer!